Nineteenth-century literature is populated by runaways, from escaped slaves to political exiles, from women fleeing bad marriages to aristocrats fleeing the guillotine. 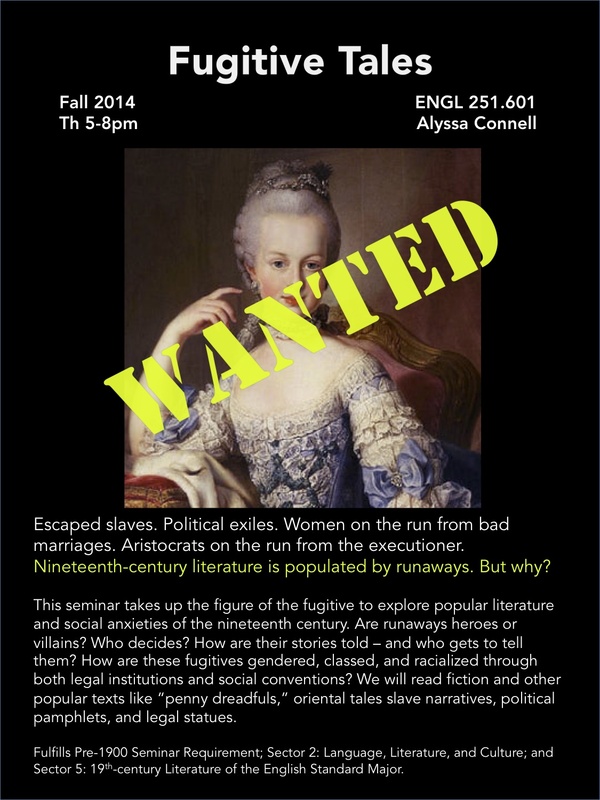 This seminar takes up the figure of the fugitive as a vehicle for understanding popular literature and social anxieties of the nineteenth century. Are runaways heroes or villains? Who decides? How are their stories told – and who gets to tell them? How are these fugitives gendered, classed, and racialized through both legal institutions and social conventions? Fiction will be the staple of this course, but alongside it we’ll read other kinds of popular texts: “penny dreadfuls,” oriental tales, slave narratives, political pamphlets, and legal statutes like the Fugitive Slave Law. These readings will include Frederick Douglass’ The Narrative of the Life of Frederick Douglass, an American Slave, Anne Brontë’s The Tenant of Wildfell Hall, Wilkie Collins’ The Woman in White, and Robert Louis Stevenson’s Treasure Island. Assignments will consist of reading responses, a presentation, and a final paper.